Branded as an ancient paradise beyond memory, Sasayuri-ann in Nara Prefecture is a unique lodging with rich history and fascinating cultural activities set in the birthplace of the Japanese ninja. 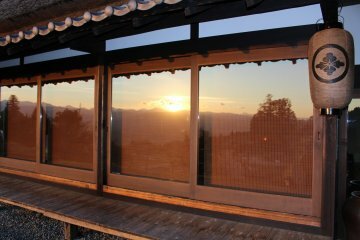 This mountain villa is the perfect combination of Japaneses style and luxurious accommodation. From the thatched roof to the traditional pine flooring and the living room with its irori sunken fireplace, Japanese authenticity pervades throughout this lodge originally constructed more than 150 years ago. While this historic home stays true to its spirit, it has also been completely restored and refurbished with every modern convenience and luxury necessary for the perfect getaway. Sasayuri-ann offers guests (two to ten people) an exclusive mountain house experience with panoramic views over the countryside and rice fields below. Rich cultural events are available as options and include a range of activities deeply associated with the region including live ninja demonstration, Noh theater, Zazen or chanting sessions in Shugendo style, traditional music performances, flower arrangement and more. This video focuses on the luxury activities available while staying at Sasayuri-ann. Events available can be viewed within the lodging and in the surrounding areas. Activities include Noh theater by Kongo, one of the major Noh performance schools in Kyoto. There is a ninja demonstration performance by Ashuno, the Iga ninja performance group. Shugendo can be performed by Sasayuri-ann owner, Tetsuji Matsubayashi, who is a Shugendo monk trained in zazen meditation. Japanese food presentations and meals are available by Kouji Nagato, owner of a Michelin certified Japanese restaurant. Flower arrangement is available through the hostess of Sasayuri-ann. Bamboo flute and koto displays are available by Toshimitsu Ishikawa, one of the famous players in the region. Each activity must be booked separately in advance with the lodging reservation. For additional information and reservations, view the English website here. This looks incredible. The variety of things offered and showcased there is stunning.